This is the time of year when squash are in season and readily available. My mom always baked squash this way, so this has become my favorite way of preparing it. Cut squash in half lengthwise and scoop out seeds with a spoon. 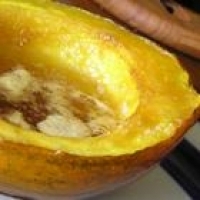 Place squash in a shallow baking pan, cut side down. Cover with foil. Bake in preheated oven for 50 minutes, or until tender. Turn cut side up; season with salt and pepper, spread with butter and sprinkle with brown sugar and cinnamon. Continue baking 20 minutes more.